Whale Rider is a 2002 New Zealand-German family drama film directed by Niki Caro. Based on the novel of the same name by Witi Ihimaera, the film stars Keisha Castle-Hughes as Kahu Paikea Apirana, a twelve-year-old Māori girl whose ambition is to become the chief of the tribe. Her grandfather Koro Apirana believes that this is a role reserved for males only. The film was a coproduction between New Zealand and Germany. It was shot on location in Whangara, the setting of the novel. The world premiere was on 9 September 2002, at the Toronto International Film Festival. The film received critical acclaim upon its release. At age 13, Keisha Castle-Hughes became the youngest nominee for the Academy Award for Best Actress before she was surpassed by Quvenzhané Wallis, at age 9, for Beasts of the Southern Wild less than a decade later. The film earned $41.4 million on a NZ$9,235,000 budget. In 2005 the film was named on the BFI list of the 50 films you should see by the age of 14. The film's plot follows the story of Paikea Apirana ("Pai"). The leader should be the first-born grandson – a direct patrilineal descendant of Paikea, the Whale Rider – he who rode on top of a whale (Tohora) from Hawaiki. Pai is originally born a twin, but her twin brother, as well as her mother, dies in childbirth. However, Pai is female and technically cannot inherit the leadership. While her grandfather, Koro, later forms an affectionate bond with his granddaughter, carrying her to school every day on his bicycle, he also condemns her and blames her for conflicts happening within the tribe. At one point Paikea decides to live with her father because her grandfather is mistreating her. She finds that she cannot bear to leave the sea as the whale seems to be calling her back. Pai tells her father to turn the car back and returns home. After the death of his wife and overwhelming pressure from Koro, Pai's father refuses to assume traditional leadership; instead he moves to Germany to pursue a career as an artist. Pai herself is interested in the leadership, learning traditional songs and dances, but is given little encouragement by her grandfather. Pai feels that she can become the leader (although there's no precedent for a woman to do so), and is determined to succeed. Koro leads a cultural school for the village boys, hoping to find a new leader. He teaches the boys to use a taiaha (fighting stick). This is traditionally reserved for males. However, Nanny tells Pai that her second son, Pai's uncle, had won a taiaha tournament in his youth while he was still slim, so Pai secretly learns from him. She also secretly follows Koro's lessons. One of the students, Hemi, is also sympathetic towards her. Koro is enraged when he finds out, particularly when she wins her taiaha fight against Hemi. Koro's relationship with Pai erodes further when none of the boys succeed at the traditional task of recovering the rei puta (whale tooth) that he threw into the ocean – this mission would prove one of them worthy of becoming leader. With the loss of the rei puta, Koro in despair calls out the Ancient ones, the whales. In an attempt to help, Pai also calls out to them and they hear her call. One day Pai finds the rei puta while swimming, signifying that she is the rightful leader. Pai, in an attempt to bridge the rift that has formed, invites Koro to be her guest of honour at a concert of Māori chants that her school is putting on. Unknown to all, she had won an inter-school speech contest with a touching dedication to Koro and the traditions of the village. However, Koro was late, and as he was walking to the school, he notices that numerous southern right whales are beached near Pai's home. The entire village attempts to coax and drag them back into the water, but all efforts prove unsuccessful; even a tractor does not help. Koro sees it as a sign of his failure and despairs further. He admonishes Pai against touching the largest whale because she has "done enough" damage with her presumption. Also, the largest whale traditionally belongs to the legendary Paikea. When Koro walks away, Pai climbs onto the back of the largest whale at the location and coaxes it to re-enter the ocean. The whale leads the entire pod back into the sea; Pai submerges completely underwater, and the spectators wonder if she has drowned, but are relieved when she comes back above sea level. When she goes out to sea, Nanny shows Koro the whale tooth which Pai had previously recovered. When Pai is found and brought to the hospital, Koro declares her the leader and asks her forgiveness. The film ends with Pai's father, grandparents, and uncle coming together to celebrate her status as the new leader, as the finished waka is hauled into the sea for its maiden voyage. In voiceover, Pai declares, "My name is Paikea Apirana, and I come from a long line of chiefs stretching all the way back to the Whale Rider. I'm not a prophet, but I know that our people will keep going forward, all together, with all of our strength." The film had budget of NZ$9,235,000. It received $2.5 million from the New Zealand Film Production Fund. Additional financing came from ApolloMedia, Filmstiftung NRW, the New Zealand Film Commission and NZ On Air. Casting director Diana Rowan visited numerous schools to find an actress to play Pai. 10,000 children were auditioned before narrowing it down to 12. Castle-Hughes impressed Caro in the resulting workshop and was cast as Pai. The film was shot in Whangara on the East Coast of New Zealand's North Island and in Auckland. Producer John Barnett said "This novel was set in Whangara and it would almost have been heresy to shoot anywhere else. There are very physical things that are described in the book – the sweep of the bay, the island that looks like a whale, the meeting houses, the number of houses that are present and of course, the people whose legend we were telling. [...] If we'd gone somewhere else and tried to manufacture the surroundings and the ambience, then I think it would have been noticeable in the picture." The whale beaching was depicted using full-scale models created by Auckland, New Zealand based Glasshammer visual effects. The 60-foot waka seen at the end of the film was made in two halves in Auckland before being transported to Whangara. The waka was given to the Whangara community after filming concluded. Whale Rider was theatrically released in 2003 in New Zealand and Germany. Whale Rider premiered at the Toronto International Film Festival in 2002. 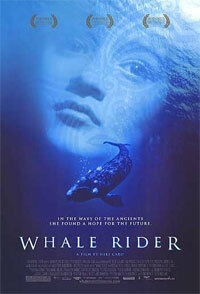 Whale Rider was released on DVD and VHS on 28 October 2003 by Columbia TriStar Home Entertainment. Shout Factory released a 15th anniversary Blu-ray of Whale Rider on their Shout Select imprint on 22 August 2017. The film received critical acclaim and Castle-Hughes's performance won rave reviews. Based on 144 reviews collected by Rotten Tomatoes, the film has an overall approval rating from critics of 90%, with an average score of 7.7 as of June 2010. By comparison, Metacritic, which assigns a normalized rating out of 100 top reviews from mainstream critics, calculated an average score of 79, based on 31 reviews, indicating "generally favorable reviews". Margaret Pomeranz and David Stratton of The Movie Show both gave the film four out of five stars. Pomeranz said "Niki Caro has directed this uplifting story with great sensitivity, eliciting affecting performances from a sterling cast, and a wonderful one from newcomer Keisha Castle-Hughes." Roger Ebert gave the film four out of four stars and said, "The genius of the movie is the way it sidesteps all of the obvious cliches of the underlying story and makes itself fresh, observant, tough and genuinely moving." He said of Castle-Hughes: "This is a movie star." Ebert later went on to name it as one of the ten best films of 2003. The Los Angeles Times's Kenneth Turan praised Caro for her "willingness to let this story tell itself in its own time and the ability to create emotion that is intense without being cloying or dishonest." Claudia Puig of USA Today gave the film three-and-a-half out of four stars and praised Castle-Hughes' acting, saying "so effectively does she convey her pained confusion through subtle vocal cues, tentative stance and expressive dark eyes." The film has also been discussed, and praised, widely within academia. Anthropologist, A. Asbjørn Jøn, discussed a range of Maori tribal traditions that resonate within the film, while noting links between the release of Whale Rider and increases in both New Zealand's whale watching tourism industry and conservation efforts. Whale Rider grossed US$41.4 million internationally. the Canal Plus Award at the January 2003 Rotterdam Film Festival. At the age of 13, Keisha Castle-Hughes was nominated for the Academy Award for Best Actress for her performance, becoming the youngest actress ever nominated for the award at that time (breaking Isabelle Adjani's record at the age of 20). She held the record until 2012 when Quvenzhané Wallis (at the age of 9) was nominated for that category for the film Beasts of the Southern Wild. The film contains music by Lisa Gerrard, released on the album Whalerider on 7 July 2003. ^ "WHALE RIDER (PG)". British Board of Film Classification. 20 February 2003. Retrieved 15 January 2012. ^ a b c "Film Fund 1 Interim Report" (Press release). New Zealand Film Commission. 18 May 2009. Archived from the original on 5 July 2010. Retrieved 5 July 2010. ^ "Whale Rider To Debut In Toronto" (Press release). South Pacific Pictures. 5 July 2010. Archived from the original on 5 July 2010. Retrieved 5 July 2010. ^ a b "Production notes" (Press release). South Pacific Pictures. Archived from the original on 5 July 2010. Retrieved 5 July 2010. ^ "Technicals" (Press release). South Pacific Pictures. Archived from the original on 5 July 2010. Retrieved 5 July 2010. ^ "Notes about the location" (Press release). South Pacific Pictures. Archived from the original on 5 July 2010. Retrieved 5 July 2010. ^ "Whale Rider (2003)". Rotten Tomatoes. Retrieved 6 June 2012. ^ "Whale Rider reviews". Metacritic. Retrieved 4 July 2010. ^ Pomeranz, Margaret; Stratton, David (2003). "Review: Whale Rider". The Movie Show. Special Broadcasting Service. Archived from the original on 11 April 2004. Retrieved 5 July 2010. ^ Ebert, Roger (20 June 2003). "Whale Rider review". Chicago Sun-Times. Archived from the original on 5 July 2010. Retrieved 5 July 2010. ^ Ebert, Roger. "Ebert's Top Movies of 2003". Chicago Sun-Times. Retrieved 30 January 2014. ^ Turan, Kenneth (6 June 2003). "'Whale Rider' movie review". Los Angeles Times. Archived from the original on 5 July 2010. Retrieved 5 July 2010. ^ Puig, Claudia (6 June 2010). "Haunting 'Whale Rider' revisits a timeless legend". USA Today. Archived from the original on 4 July 2010. Retrieved 4 July 2010.